Use content marketing to lead the buyer through 4 steps in the buying journey. The weakest link in BtoB marketing happens on the first step in the buyers’ journey. In step 1, buyers try to figure out whether they have a problem. They ask, is it serious? Or can we just stick with the status quo? In a recent Forrester Research study, 80% of BtoB websites skip over helping buyers with the first step. Instead, they plunge directly into “me, me, me,” talking about the company and products. Wrong play. When marketers miss opportunities to get buyers to take the first step, they miss the chance to create new customers and expand the market. During the first step, many potential buyers will decide to stick with the status quo. How do you generate new demand from reluctant, risk-averse customers? Magnify the problem. Show the problem visually. The more visual and emotional your content is, the likelier you can spur buyers to act. At Content Marketing World, I invited marketers at my talk How to Speed the Journey from Content to Cash to write down questions on mapping content marketing to the buying journey. Prashanth Hebbar, Co-Founder and COO of Knobly Media, asked about how to put “magnifying the problem” into practice. How can content marketers help buyers recognize a problem? How can we help buyers realize they need to take the problem seriously? In general, show buyers how scary the consequences of sticking with the status quo will become. Equip sales to challenge the status quo with the right set of sales enablement tools. Apply the ideas in The Challenger Sale to content marketing. Show how an industry-wide problem will affect the buyers’ company. Do original research or a survey that focuses on what is likely to happen in the next 3 to 5 years. Gain third-party validation from an industry analyst or a credible survey. Deliver a thought-provoking message. Dare to be controversial. Thought-provoking white paper showed customers the End of Profitability. But, the average revenue per user staying flat. In other words, mobile users want to use more and more data but do not want to pay any more for it. As a result, mobile operators face a profit squeeze, reaching the “End of Profitability” in 3 to 5 years. This thought-provoking message became a well-read story on industry trade sites. The controversy commanded attention from executives and buyers at Telefonica, Telmex, and Google. It opened the doors to new customer contacts. Show how a problem specifically affects a buyers’ business. 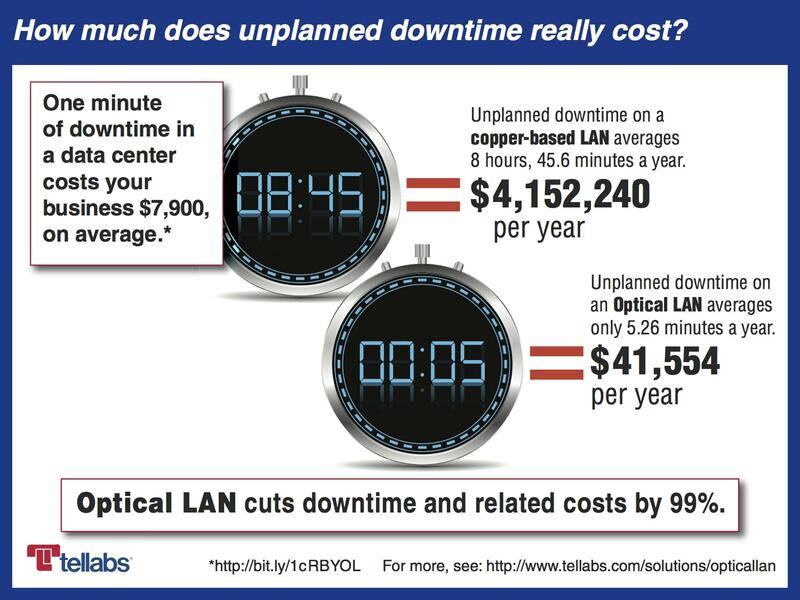 We showed chief information officers (CIOs) how much downtime they suffer with existing local area networks (LANs) – and exposed the hidden costs in the infographic below. Infographic reveals $4.1 million in hidden costs resulting from downtime. 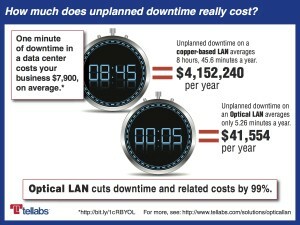 A conventional LAN’s unplanned downtime can cost a business more than $4.1 million dollars a year. But that’s a hidden cost. Now, with new Optical LAN technology, CIOs can cut the hidden costs of LAN downtime and related expenses by 99%. Show a problem that affects one or more department(s) in a business. For example, if a mobile operator takes too long to detect and address quality problems in mobile networks, users suffer, complain and ultimately defect. The network department is positioned to identify mobile quality problems, but it’s the marketing department’s job to hold on to customers. Both departments have a stake in mobile quality problems, but the network holds the budget for network improvements. The 2 departments need to work together to head off quality problems and customer churn. 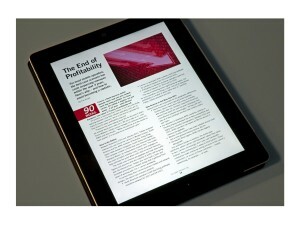 What’s the implication of poor mobile quality? How does poor quality translate into customer churn, lost revenue and increased expense? What is the ultimate cost to each department and to the overall business? Show a problem that affects key users in the company. For example, if the LAN goes down and the CEO can’t get his email, he calls the CIO directly. An unhappy CEO can reset IT department priorities and drive change that IT hadn’t recognized the need for yet. If you have questions on content marketing and the buyers’ journey, please ask me here.